All-in-all, I thought it was a pretty fabulous event and would recommend it to anyone considering it. Where else can you go do a gravel event with 2700+ other riders?! Plus, it's a true "everyman" event. They may call it a race, and technically it is, but all kinds of folks were riding at all kinds of paces on all kinds of bikes (cross, mtb, fat, tandem, hybrid, road, etc). The course was great, but no better than anything we have to offer here in Ohio, so hopefully we can develop an event to rival this one! For the most part everything was well-organized. Packet pickup was easy to find and they were smart enough to have temporary parking there just for pickup (although others were using it to get ready). There's a surprising amount of parking in tiny Hastings, MI, so thankfully finding a permanent spot wasn't too bad. The start was really well-organized. You get a wave number before the race and line up accordingly based on volunteers holding up signs with the wave numbers. Then waves launch every 3 minutes (the event is chip-timed). I of course dropped my chain right at the start and had to chase to try to catch back up to my group. After a few miles, things got pretty jumbled, so you have to pay attention and watch out for faster riders passing you while dodging the slower ones. This can get a bit dicey since the roads are littered with potholes. Probably around 80% of the course is dirt/gravel, though there were a couple of longer paved sections. Gravel I think is kind of a misnomer, though. I would call it a beach race! The roads were extremely sandy and considering the wet winter and the downpours the night before, they were soft--like riding through peanut butter. Extremely hard work, no coasting. That being said, they drained really well, so it wasn't as sloppy as I expected. There were, however, four or five huge mud pits and flooded sections that were as long as a couple hundred feet. The fat bikes ruled these. The hills weren't extreme (max grade 12% and nothing longer than a few tenths of a mile) but were constantly rolling, making for quite the workout. Overall the course was great and extremely scenic. Lots of wooded sections, but some more exposed stuff out in the frozen fields. Only real bummer was that the two "unimproved" road sections had to be removed since they still had over a foot of snow on them! Typical wooded section, note the potholes! Nearly every turn had a course marshal and all the major intersections had police/sheriff. Though the race is technically open road, the locals know it's happening and stay away. Traffic was light and those passing were courteous. Speaking of the locals, they really come out to support, which was awesome. Lots of hand-made signs and cowbells along the course. Folks having get-togethers in their front yards and cheering. Encouragement on the hills. It was a blast. For the most part the riders were fun and friendly as well. And there were tons of volunteers. The finishing area was great too. It started snowing, so I didn't stick around long, but they had mobile food vendors (wood fired pizza--delicious! ), Founder's Brewery beer trucks (they sponsor the race), a pretty well-stocked exhibit area, a big stage for awards and bands, and what honestly seemed like too many port-a-potties (when does that ever happen!). Again, this is a well-run event. 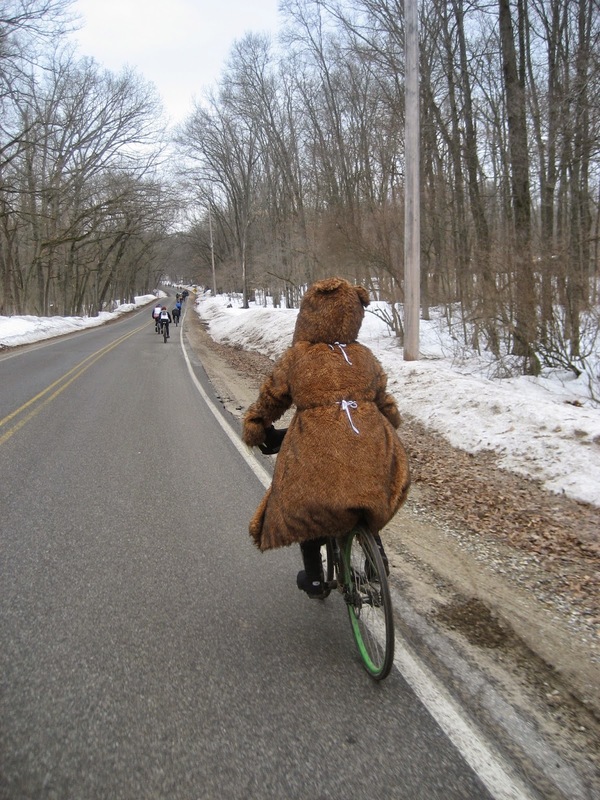 Two fun highlights: the woman in the bear costume (see pic) and the couple on the tandem that got engaged. I didn't get to witness the proposal first-hand, but saw the pictures. As far as I know, she said yes. Would've been an awkward ride to the finish otherwise! For anyone who likes gravel or is even just curious, this is a great event. Keep in mind that it does take place in March and the weather can be rough. 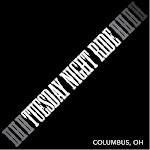 It was icy last year, tolerably cold this year, and the website has pictures of riders in shorts, so basically it's like Ohio and anything goes! If you're willing to chance the weather, though, I recommend making the drive. For more info, and to check out the professional photos of the event, head on over to the Barry-Roubaix website.